No. 9, Jalan PJU 1A/18 (TPJ 7), Taman Perindustrian Jaya, 47200 Subang, Selangor, Malaysia. Unimech, a market leader in the supply of valves, fittings, instruments and engineering services, has established 12 manufacturing facilities, majority of which are ISO-registered, locally and overseas to meet emerging market demands for quality products at fair prices. Products are SIRIM and IKRAM certified in stages, likewise the registration of Trade Mark. Under the banner of Unimech are its well established house brands namely: ARITA, UNIJIN, Q-FLEX, I-CONTRONIC, SVR, SANITARIO and AR. Unimech is an Integrated Valve and Fittings Set Up with its own manufacturing facilities to produce its own brand name product which is distributed by its own marketing networks spread over Malaysia, Singapore, Indonesia, Thailand, China, Australia, Korea, Vietnam and Philippines. 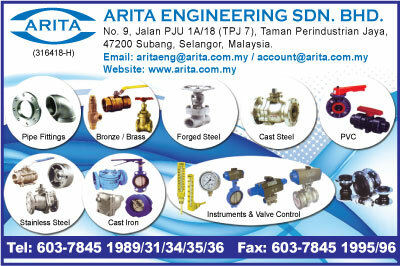 Arita Engineering, is your ONE-STOP VALVES AND FITTING SOLUTION PROVIDER. With our vast experience, was are able to provide the best delivery which has time and again won the confidence of our customers.